A baked ham, some scalloped potatoes, green beans, and candy for dessert isn't the worst Easter dinner one can make. But there are many ways to freshen up that old favorite with seasonal produce and new techniques, while still keeping it easy to put together, even if you're hosting a crowd. This Easter menu provides a wide variety of main dishes, cocktails, several soups and salads, a host of side dishes, and a handful of perfect-for-spring desserts. 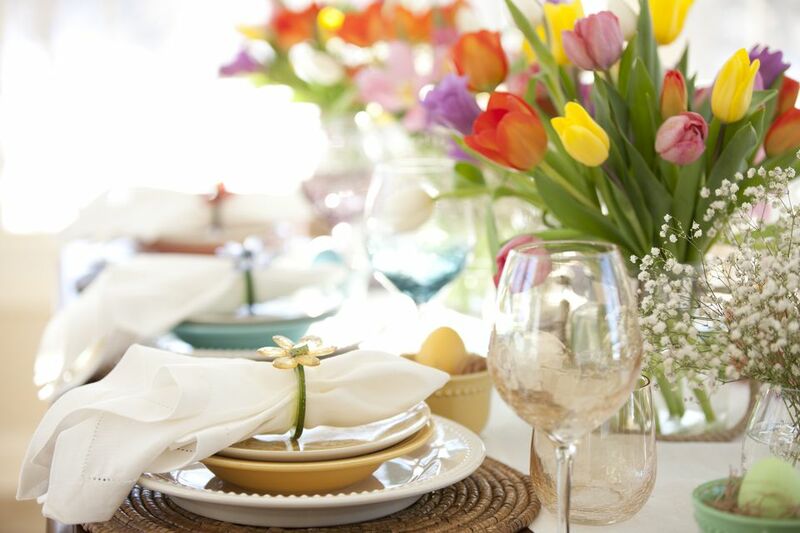 Scroll through and let inspiration hit you while you plan for the best Easter menu ever. Lamb is traditional at Easter for a variety of reasons, but the phrase "spring lamb" refers to the most pressing one: when allowed to follow their natural breeding pattern, lambs are born and slaughtered in the spring. This recipe marinates a boneless leg of lamb and has you throw it on the grill—perfect for a crowd and a great way to break in the grill for grilling season. Looking for a ham recipe this Easter, but not sure which one to select? Take a look at this list of ten baked ham recipes. They run the gamut, from classic pineapple to whiskey-glazed. Yum! Balsamic vinegar and herbs make an easy but flavorful marinade for these easy lamb chops. Lamb chops are a great choice for a smaller Easter group. They can be tricky for bigger groups, both because they tend to be quite expensive, but also because cooking them accurately requires some attention and it can be challenging to get a whole lot of them to the correct doneness at the same time. Once you get the hang of it though, you'll be delighted with how this dish turns out! While far from a traditional Easter table offering, these lamb meatballs are easy, delicious, and perfect for spring. Plus, with all the seasoning and the meatball-form, they are capable of converting lamb-haters into lamb-lovers. A roast chicken is another fabulous main dish choice for the Easter table. Easy, crowd-pleasing, and delicious, roast chicken is usually a safe bet if you have any picky eaters. Have a bigger crowd? Roast two or three! Whether you offer this quiche as a side dish or a vegetarian entrée, it brings tons of spring flavor to the mix. Plus, it holds up well at room temperature, which is perfect when the dinner table conversation is flowing. A few strawberries and some rosé wine make for a simply beautiful cocktail in the form of springtime sangria if you want to offer your guests something special. Not in the mood for sangria, but still want to offer an eclectic beverage? Try these rhubarb-based daiquiris! If neither of those options tickle your fancy, or you have a large gathering this Easter and want to provide several options, check out this list of ten spring cocktails. It covers both alcoholic and non-alcoholic options alike. This easy pesto sauce is delicious on lamb, with ham, or spooned over pretty much any vegetable. Add it to your Easter table for a burst of spring flavor and color. If you plan a bit ahead, you can offer these zesty pickled asparagus spears as a seasonal appetizer while waiting for the main feast to start. Or, if you're lucky enough to have fiddleheads on hand, try pickled fiddleheads instead. A chilled soup is a stylish way to start any meal, especially the spring feast that any Easter dinner likely hints at. This chilled watercress soup is easy to make, tastes best when made ahead, and features the peppery watercress of spring. If a soup course intrigues, another solid spring option is this utterly divine cream of artichoke soup, inspired by the amazingly rich version served at Duarte's Tavern in Pescadero, California. Fresh asparagus spears, tender butter lettuce, delicate herbs, and cunning mozzarella perlini come together to create an effect more than the sum of their parts in this simple yet elegant salad. It is a bit unusual and may raise some eyebrows, but this beet salad is wonderfully springy and super tasty. Baby beets get roasted, shredded, and mixed with yogurt. A bit of garlic, olive oil, and dill add even more flavor. It is particularly good alongside a juicy roast chicken or tender lamb. Spring leeks, butter, and a sprinkle of salt combine into more than that simple combination in this easy, flavorful side dish. It is particularly stunning with roast chicken or baked ham. Roasting is one of the easiest and tastiest ways to cook asparagus, and this is a fabulous dish to include on any Easter table. Totally spring. Totally delicious. There's tons of flavor in this simple carrot ginger casserole. Best of all for a busy host, it can be completely prepped the day ahead and baked when you're ready to serve. This homey favorite may seem too simple for a big celebration, but the colors are so lovely and the flavors so spring-like, it's worth considering—especially since it comes together in a snap. Fava greens aren't super easy to find, but they are worth seeking out for their nutty flavor and tender texture in this sautéed fava greens recipe. Look for them at farmers markets (farmers who grow fava beans may well bring the greens they cull to market) and specialty grocery stores. Or, if you grow fava beans or broad beans, harvest the greens yourself. They aren't easy to find, but if you get your hands on fiddlehead ferns—at a farmers market or specialty shop or by foraging for them yourself—a quick turn in a hot pan is one of the easiest ways to cook them up. Morel mushrooms are a harbinger of spring that pack a lot of flavor in a small package. Here, they are simply sautéed, but grilling them is a tasty option, as is making a morel mushroom risotto, which lets you make a lot of the flavor in just a few mushrooms. Speaking of risotto, contrary to popular belief, risotto is actually an easy dish to make. It lets you highlight simple yet distinctive flavors and provides a warming, comforting element to any meal. In this green garlic risotto recipe, spring favorite green garlic flavors the pot. A classic addition to the Easter table, these scalloped potatoes are creamy and topped with plenty of cheese, a great staple for any Easter dinner menu. Just as warm and creamy as scalloped potatoes, this recipe for potato leek gratin shines with fresh spring leeks in the mix. Note that it reheats beautifully, making it a good candidate to make ahead, partially bake, and then finish in time for the big feast. These potatoes in cilantro sauce get coated in a flavorful sauce made mainly from minced or puréed cilantro—they add flavor and lovely green color to the table. They're also a little more interesting than plain roasted or steamed potatoes, if you're looking to mix things up a bit. If you'd like to stick with tradition and make everyone's favorite: classic mashed potatoes, this step-by-step guide will help you make them perfectly every time. Tres leches cake is popular throughout Latin America. It's moist and sweet and irresistible. This version features fresh spring strawberries, making it perfect for Easter. If you'd like to keep things more traditional, we recommend making these classic strawberry​ shortcakes! They are easier to make from scratch than you might think. Buttery spiced oats turn tart rhubarb into a lovely sweet crumble. Homey and delicious all at once, it's oh-so-perfect for spring. This homey bread pudding is extra delicious when served with hard sauce. If you're looking for a recipe to mix things up for dessert, we recommend trying out this one. This pound cake, baked and iced to look like a lamb, is a traditional dessert on Polish Easter tables. It requires a lamb-shaped cake mold, but to have such a fun and festive dessert, it's worth it! If you're trying to keep things simple, then these Easter bunny cookies made from iced Milano cookies, cut marshmallows for ears, and candy are the perfect option!